Two new updates. First is the 2018/19 Q2 Performance Measures Report: https://www.halifax.ca/sites/default/files/documents/transportation/halifax-transit/Halifax Transit - 2018-2019 Q2 Performance Measures Report.pdf System-wide boardings are up 4.1% from the same quarter a year ago, though the extra transfers from the Lacewood area adjustments can account for some of that. Ferry boardings have declined 10% from last year, but are still quite a bit higher than the levels pre-Big Lift. Notable are the ridership numbers by route - many of the altered routes show a noticeable increase in riders (Route 3 vs. the old 52; Route 4 vs. the old 17, 18 and 42; Route 39 vs. the old 16), and many of the new routes have decent-to-good passenger per hour counts (with the 28 doing quite well in particular). But more importantly... https://www.halifax.ca/sites/default/files/documents/transportation/halifax-transit/Halifax Transit - 2019-2020 Annual Service Plan (Proposed).pdf ...the proposed 2019/20 Service Plan is out. This year's focus is the overhaul of routing in the Sackville area, with some changes also planned in Burnside and Purcell's Cove areas too. Proposed 2019/20 Route and Schedule Adjustments: Group A: Route 90: Route extended on Larry Uteck to service West Bedford Route 86: Renumbered to NEW Route 196 Basinview Express with the same service levels. May have service levels adjusted in future years. Group B: (NEW) Route 8: Replaces Route 80, using the same routing at Corridor levels of service Routes 64 + 66: Route 66 to end at Highfield Terminal (no service to Burnside or Cobequid). Route 64 routing adjusted to service areas removed from Route 66. (NEW) Routes 82/182: Service between Sackville and Cobequid Terminals via First Lake Dr. Peak express service to/from Downtown. Replaces section of current Route 82. (NEW) Routes 83/183: Expanded service to Springfield Estates and other areas in Middle Sackville. Peak express service to/from Downtown. Replaces current Route 83. Route 84: Upgraded to conventional route - provides 7 day a week service along its existing route (Scotia Square to Sackville Terminal). No service to/from Summer St. (NEW) Routes 85/185: Provides service between Millwood subdivision and Sackville Terminal. Peak express service to/from Downtown. Replaces section of current Route 82. Current Routes 85 and 185 completely discontinued. (NEW) Routes 86/186: Provides service between Sackville Terminal and Kinsac Rd. off Beaverbank Rd. Peak express service to/from Downtown. Replaces current Route 400. Route 87: Re-routed to use Sackville Dr. between Sackville and Cobequid Terminals. Also replaces section of Route 66 removed from Bedford/Burnside. Route 88: Re-routed to use Old Sackville Rd. between Sackville and Cobequid Terminals. Will have increased service compared to the current route. Group C Route 89: Discontinued (NEW) Route 91: Services West Bedford and Hemlock Ravine to Mumford Terminal. No service to/from Downtown Replaces existing Route 81. (NEW) Route 93: Service between Bedford and Downtown via the Bedford Highway. Group D (NEW) Route 25: Provides service between Governor's Brook and Mumford Terminal. 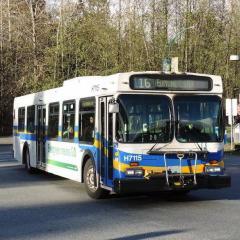 Replaces off-peak and weekend service provided by current Route 15. (NEW) Route 26: Provides service between Springvale and Mumford Terminal. No service to/from Downtown. Replaces current Route 5. (NEW) Route 415: Provides weekday peak service between York Redoubt and Mumford Terminal. No service to Bayers Road Centre. Replaces current Route 15. Other Adjustments: Route 29: Adjusted in the outbound direction to not enter Mumford Terminal. Route will stop on Mumford Road. Schedule and Service Adjustments - Effective February 18th, 2019: Route 21: Schedule adjustment on James Street (layover reduction) Route 39: Additional weekday evening trip Lacewood-bound departing Bridge Terminal at 10:57pm Route 123: Stops added along St. Margaret's Bay Rd. Route will no longer travel along Quinpool Rd - instead using Chebucto to Cunard to Robie to Bell (reverse in PM) Route 194: Inbound trips will now turn left on Broad St. instead of right. Outbound trips turn right at the first entrance to Broad St. then right on Gary Martin. In addition, the express section will now utilize Dunbrack St. through Clayton Park. Route 330: Outbound trips will now access Gottingen St. from Duke St. instead of North St. Alderney Ferry: Holiday service added on Easter Sunday. 2018/19 Service Plan has been officially released: https://www.halifax.ca/sites/default/files/documents/transportation/halifax-transit/Halifax Transit - 2018-2019 Annual Service Plan.pdf This year's planned adjustments have been split up into four groupings, each of which will be done all at once so as to minimize disruptions. Planned Schedule and Route Changes - 2018/19 (Implemented as of August 20th, 2018) Group A: (NEW) Route 3: Replaces Route 52. Uses existing routing between Burnside and Lacewood Terminal. (NEW) Route 28: Provides service between Lacewood and Mumford Terminals via Bayers Lake Business Park and Washmill Lake Dr. Route 64: Increased mid-day service temporarily to complement Route 3 until Wrights Cove Terminal opens. Group B: (NEW) Route 2: Replaces existing Routes 2 and 4. Service provided between Lacewood Terminal and Downtown Halifax along similar routing to the 2/4. (NEW) Route 30: Services local areas served by the existing 2 and 4. Will run as a two-way loop - 30A travels clockwise, 30B counterclockwise. Group C (NEW) Route 4: Replaces Routes 16, 17, 18, and 42. Provides service between Lacewood Terminal and the Saint Mary's and Dalhousie area. (NEW) Route 39: Provides service between Lacewood Terminal and Bridge Terminal (similar to existing Route 16). Group D Route 21: Routing adjustments in Timberlea. Decreased service off-peak. Peak trips no longer servicing Downtown Halifax. Routes 31, 33, 34, 35: Upgraded to Express Routes 135, 136, 137, and 138. Lacewood to Tantallon section of 33 becomes Rural Route 433. (NEW) Route 123: Replaces existing Route 23. Routing adjustments in Timberlea. Will not service Mumford and take a more direct route Downtown. Route and Schedule Adjustments - Effective February 19th, 2018: Alderney Ferry - Weekday schedule adjusted on a trial basis. 15 minute service from 6:30am to 8pm, 30 minute service from 8pm to end of day. Route and Schedule Adjustments - Effective August 21st, 2017: (NEW) Route 194 - West Bedford Express - Four weekday AM (inbound) and PM (Outbound) trips between West Bedford / Larry Uteck (west of Hwy. 102) and downtown Halifax. Map Schedule Route 330 - Last current AM trip to depart Tantallon at 8:00am (5 minutes earlier). Additional AM trip to depart Tantallon at 8:10am. No changes to PM trips from Halifax. Route 402 - Service discontinued (low ridership) School Specials - Service discontinued (low ridership / duplication by other routes) It is also noted that departure times at North/Brunswick eastbound may change for multiple routes. 2017/2018 Service Plan is out: http://halifax.ca/transit/_assets/documents/2017-18AnnualServicePlan.pdf No ridership numbers for now, as they're changing their reporting processes and such. Planned Route/Schedule Changes - 2017/18: Route 6: Discontinued (Service area covered by NEW Route 9 + Route 22) Route 9 (Barrington): Replaced by NEW Route 29. Increased service, especially on weekends. Service added to Bayers Rd. Centre and removed from lower parking lot at Point Pleasant Park (all trips end at Tower Rd. Turning Loop). Will service Water St. Terminal via Hollis and Lower Water St. Routes 19/20: Replaced by NEW Corridor Route 9A (Greystone) and 9B (Herring Cove). Combined 10-15 min peak headway, 15-20 min off-peak, 30 min weekend/holiday. Current routing to be used, with shift in frequency (more trips between Greystone Dr. and Downtown, less between Greystone Dr. and Lancaster). No peak trips to Dockyard. Route 22: Service discontinued to Exhibition Park. NEW Route 194 - West Bedford Express: This new route will service Gary Martin Drive, Hammonds Plains Road, Innovation Drive, Broad Street, and Larry Uteck Boulevard West, with limited stops to downtown, ending at Summer Street at Bell Road Route 330: One additional AM and PM peak trip to and from Tantallon. Route 370 (Change Effective May 29th): Two new stops added on Main Street (Main near Major/Gordon. and Main near the Black Cultural Centre). Also, service to/from Micmac Terminal as part of a six month pilot program. Route 402: Discontinued (Low Ridership). Alderney Ferry: To be reduced back to pre-Big Lift levels of service upon completion of the project. (Didn't city counsel agree to keep the increased service for six months to see if ridership stayed as high as it currently is? Or did they vote that down?) In addition, if funding allows for additional changes to be made, then expect to see Route 86 converted into its Express Route version (Route 186, with increased service), and/or the introduction of Route 192 Southgate Express and/or Route 196 Larry Uteck Express. Spotted bus 1220 this afternoon on the Route 2 heading downtown. Not used to seeing bright white text on the destination sign. The new livery looks pretty snazzy on a 40 foot LFS, too. Service and Schedule Adjustments - Effective February 20th, 2017: Route 56: Service between Micmac Terminal and Penhorn/Portland Hills Terminals discontinued. Route will now begin/end at Bridge Terminal, travel to Micmac along the routing of Route 55, then regular routing through Dartmouth Crossing. Departure times adjusted to provide equal headway with Route 72 in Dartmouth Crossing. Route to run from 6am to midnight, Monday to Saturday, and 7am to 11pm on Sundays. This is the only one announced so far - will update if more are added. Also, any word on when those new Novas are scheduled to arrive? I thought the first batch was to have arrived by now - or did they get pushed back? Route, Schedule, and Rider's Guide Adjustments - Effective November 28th, 2016: Mackay/Macdonald Bridge Shuttle: Service reduced to Sunday to Thursday only. Route 1: Service between Bridge and Scotia Square reinstated 7pm Friday to 7pm Sunday. Route 10: Service between Bridge and Scotia Square reinstated 7pm Friday to 7pm Sunday. Route 14/61: Service between Bridge and Scotia Square reinstated 7pm Friday to 7pm Sunday. Route 15: Departure Line stop # change @ Mumford Terminal (new number 8641). Route 19: Route start/end point changed to "Greystone before Cobalt Walk" (Stop # 6798) in Rider's Guide. Route 20: References to "Greystone (Turning Loop)" changed to "Greystone before Cobalt Walk" (Stop #6798) in Rider's Guide. Route 21: Departure Line stop # change @ Lacewood Terminal (Lacewood/Halifax bound only - new number 9109). Route 23: Departure Line stop # change @ Greenwood Heights (Mumford-bound only - new number 6624). Mumford-bound time point at "Hwy. 3 and Lakelands" changed to "St. Margaret's Bay & Lake Lands Park" in Rider's Guide - departs this point 2 minutes later on all trips. Route 32: "Dentith Rd. and South Centre Mall" time point changed to "Dentith and Herring Cove" in Rider's Guide. Routes 33/34: Departure Line stop # change @ Lacewood Terminal (Lacewood/Halifax bound only - new number 9113). Route 35: Lacewood-bound time point @ MSVU removed from Rider's Guide. Route 51: Time point at "Princess Margaret & Windmill" changed to "Windmill and Waddell. - Burnside-bound stop # change (new number 8511). Route 52: Service across Macdonald Bridge reinstated 7pm Friday to 7pm Sunday. Route 54: Route start/end point changed to "Breeze and Appian Way" - new stop # 6460. Route 56: Departure Line stop # change @ Penhorn Mall (Dartmouth Crossing bound - new number 8941). Route 57: Departure Line stop # change @ Penhorn Mall (Woodside bound - new number 8941). Route 60: All weekday trips to depart Woodside Ferry Terminal 1 minute earlier (both directions). Route 66: Departure Line stop # change at Brownlow/Eileen Stubbs (new number 6326). Route 79: Departure Line stop # change at Portland Hills Terminal (Cole Harbour bound - new number 8957). Route 80: Departure Line stop # change at Cobequid Terminal (Halifax bound - new number 6297). Route 87: Departure Line stop # change at Cobequid Terminal (Bridge bound - new number 6297). Fixed typo where the 10:13 to 12:43 departures from Windmill/Wright were incorrectly listed as one hour later. Route 88: Departure Line stop # change at Cobequid Terminal (new number 6297). Route 89: Departure Line stop # change at Cobequid Terminal (new number 6297). Time point at "Innovation and Hammonds Plains" changed to "Innovation and Angus Morton". Route 320: Service between Bridge and Albemarle reinstated 7pm Friday to 7pm Sunday. Route 330: Departure Line stop # change @ Sheldrake Lake (Tantallon bound - new number 7618). Route 370: Departure Line stop # change @ Bridge Terminal (Porters Lake bound - new number 7609). Route 401: One-way trip times increased. Departures adjusted to compensate - some trips will now depart substantially earlier or later than usual, so check your schedules. Route 402: "Dentith Rd. and South Centre Mall" time point changed to "Dentith and Herring Cove" in Rider's Guide. Guess the all-weekend shuttle experiment didn't work...or they're preemptively pulling the shuttles so they're not running in January/February when they won't be needed anymore... Still not much for actual schedule changes, outside the timing changes to the 401, but there's still February, and they planned on re-routing the 56 to the Bridge Terminal this year, so we can start counting down to that, I guess. Pretty sure that Dartmouth III is retired. It's been docked at the Dartmouth Coast Guard base (between Alderney and Woodside Terminals) since Viola Desmond came into service. Halifax III is being kept as a spare unit for now, and they do rotate it in and out of service every few days. Route and Schedule Adjustments - As of August 22nd, 2016: Mackay Shuttle - Service to run during weekend bridge closures. First trips depart Bridge/Scotia Square at 5:30am, then every 15 minutes to 1:15am. Macdonald Shuttle - Service to run if bridge remains open on weekends (same times as above). Route 20 - Now provides ALF service. Route 330 - Additional AM Peak trip departing Tantallon Park and Ride at 7:40am, arriving at Albemarle St. at 8:21am. Additional PM Peak trip departing Albemarle St. at 4:37pm, arriving at Tantallon Park and Ride at 5:22pm. The change to the shuttles irks me, if only because, when I work Saturdays, I usually would either take the detoured 52, or take anything else to Halifax, then get off at the bottom of North St. (which they were allowed to do). I'm not too happy about being forced to go all the way to Scotia Square, just to get to North St. Understandable since the bridge should be closed every weekend for the rest of the year, but I don't have to be happy about it.